Amazing place. In a beautiful historic house with a courtyard and great furnishings. Thank you for everything, Jessica and Virginia! Especially recommending the Burger pancakes and our funny breakfast talks! :-) Thank you for having us and making us feel very much at home. We'll come back to this incredible palazzo! Beautiful place! Bountiful breakfast. Kind hosts. Perfect location! Palazzo Sant Ursula is such a wonderful place to stay! The owners are friendly, accommodating and helpful, the place itself is tremendously charming and the location and price cannot be beaten. The rooftop deck is a wonderful place to have a coffee and enjoy the lovely view of the Grand Harbor. I’m quite sure that everytime I return to Malta, this is where I will stay. Great place, just a couple of minutes away from all the main streets of Valletta. We stayed at the Antique room and had breakfast and towels included. We saw some reviews mentioning the lack of air-con however we never an issue with the temperatures (I think the dehumidifier in the room helped!). Jessica and Virginia were great hosts. The highlight of the place was definitely the views from the terrace and being able to chill in the sun. Would definitely recommend! Awesome location, in a quiet street but two blocks from everything. Very nice building, with a very pleasant rooftop. Friendly and welcoming staff, cool breakfast. 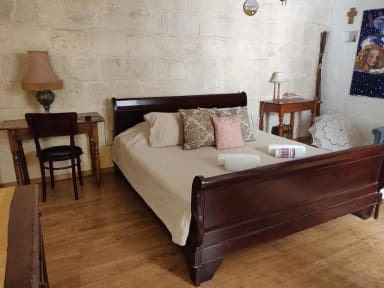 Great value for the price in Valletta. Thank you ! I stayed three nights at Palazzo Sant Ursula over New Year. The location is pretty spot-on, just a short walk up the hill and you're at the center of Valletta; bus terminal is like 5-10min walk away. The staff is super friendly and accommodating. Such a unique place, great details in each room and common areas. The breakfast is simple, but good. The wifi is non-existing in the rooms, but good enough in the common areas. Rooms are quite cold at night, but the duvets are warm enough.